A GoFundMe campaign has been created to support a former UBC athlete that was tackled, tasered and arrested by Vancouver Police Department (VPD) officers earlier this year. A few months after a February CTV news report detailed the arrest of former Thunderbird Jamiel Moore-Williams following an alleged jaywalking violation, Katherine Carol created the GoFundMe to help raise funds for Moore-Williams’s legal fees. Moore-Williams is a personal trainer at Rep 1 Fitness, the gym that Carol works out in. 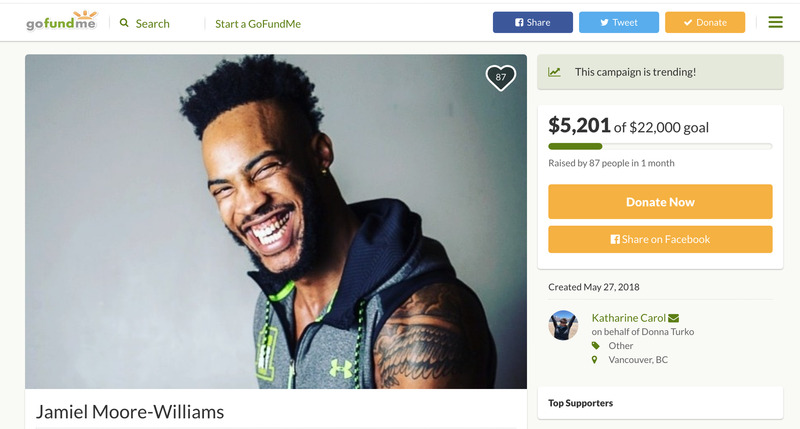 The GoFundMe’s fundraising goal of $22,000 is aimed at fighting the charges laid against Moore-Williams — jaywalking and obstruction of justice. Carol said that she had read about the incident in the news and when she realized who the story was about, she spoke to him about it. She wanted to see if there were people out there who were interested in helping Moore-Williams with his legal costs. “I talked to Jamiel and asked whether he was okay with this — I didn’t want to do anything without his permission — and he said he was,” said Carol. “And then he provided me with most of the writing, and then I just set up the Gofundme account on his behalf. “Jamiel is a very, very humble person. He feels bad even asking people to help,” said Donna Turko, Moore-Williams’s lawyer. “That’s the kind of guy he is. During the incident and as captured in the cellphone video provided to CTV, Moore-Williams said that he was targeted and stopped because he was black. The VPD has denied this. Since then, the Police Complaint Commissioner has ordered an investigation by the RCMP into the conduct of VPD officers involved in the incident. Created on May 27, the GoFundMe page is currently at $5,201 out of $22,000 as of the time of this writing.